A brilliant synth with lots of hands-on control and a well-defined, powerful, upfront sound. The P08 improved - and then some! Modulation is a breeze to set up. Keybed feels light years ahead of the P08. Setting unison, chord and legato modes is hidden in the Misc menu. Back in 2007 when the Prophet 08 was released, it really reinvigorated the analogue poly market as it offered a new level of features and sound for a reasonable price. The sequel isn’t called the Prophet 08 Mk2 as expected - it’s the Prophet Rev2. The Rev2 has the now standardised DSI family look, with rubberised silver-collared knobs, red-backlit switches and chunky wooden end cheeks. The 08’s front panel Lexan panel sticker has made way for direct screen-printed graphics (like the Prophet 6) which adds a further air of class and quality to the design. In fact, everything feels more upmarket compared to the 08, including the knobs, switches and the keybed. Speaking of which, this is a huge improvement over the more clacky 08 keybed and it’s very similar to the keybed in the Prophet 6 and OB-6. Plus, there’s an extra octave which makes a big difference to playability and the extra range really comes in handy. The Rev2 is available in three versions - the 8-voice (the nearest equivalent to the outgoing Prophet 08 and costs £1,435); the 16-voice (this review unit) at £1,914; and the 8- and 16-voice desktop versions at £1,243 and £1,722 respectively. You can also upgrade the 8-voice models to 16-voice models down the line, with the upgrade board currently costing £573.60. The 08’s front panel has received a complete makeover with the most noticeable difference being that the wide, two-line red digit display has made way for a white-on-black square OLED. This relays patch names, modes and parameters to the user clearly and concisely, though some of the writing can appear small at times. A couple of minor criticisms - firstly if you’re playing with your left hand and want to tweak parameters via the Parameter and Value knobs using your right, your hand often obscures the screen. Similarly, if you want to change patches and banks with your left while playing with your right. Also when programming and tweaking settings we often accidentally turned the Patch and/or Bank knobs rather than the Parameter and Value knobs which resulted in us completely losing our in-progress patch; perhaps a ‘long press’ mode could be implemented for the Misc parameters button which could disable the program/bank knobs (when programming). Plus, we would have included the direct bank and patch buttons from the Prophet 6; these would have enabled much quicker patch access/recall and would have allowed you to have ten patches in front of you at once. Moving on, while the wheels being placed above the keyboard still isn’t the most natural place to have them, this does keep the overall length down, which means less bulk to carry. Next to the wheels is the unison button, which places up to 16 DCOs in a subtle or monstrous stack! Again, we’d like a long press mode for unison to set the number of voices/chord mode in combination with the value dial, as currently this involves menu diving. Also, it’s counter-intuitive that you have to menu dive to set multi/legato triggering. The biggest upgrade on the Rev2 is the addition of the FX engine, which allows you to take the core sound a whole lot further and houses several digital effects including chorus, phasers, flangers, reverb, digital and BBD delay emulations, distortion, ring mod and a resonant high-pass filter. These effects all sound high-quality and are musically voiced to complement the DCO sound engine - each effect also has two modulatable parameters and a modulatable mix parameter (which greatly extends the usefulness of the effects and the Rev2’s general sonic palette). However, you can’t use more than one effect per-layer (as on the P6). Also, the digital delay doesn’t sound as wide as on the P6 (which I’m hoping can be tweaked in a firmware update). The 64-step poly-sequencer (with transpose) is a great sketch pad that can help form the backbone of whole tunes, live or in the studio, while the gated sequencer is great for complex step-based modulation sequences and has four tracks to play with. The arpeggiator has several modes including random and assign (though no poly mode) and like the sequencer, it syncs to MIDI-clock. Minor beefs aside, the rest of the new panel is more logically laid out than the 08 with all three envelopes placed together on the right (filter, amp, auxiliary). The comprehensive modulation section (which includes four LFOs and eight assignable mod slots) is also much easier to set up and all modulation resides on the left of the panel; simply hold Source and turn any dial to set mod source, and hold Destination and turn any dial to set destination. Easy! And to set up velocity or pressure as a source, just tap or deep-press any key. One caveat - we loved how on the P12 you could press and hold LFO1’s button and simultaneously edit all four LFOs; you can’t do that here but it could be a future firmware improvement. Now the sound engine. Well, it’s the same distinctive-sounding engine as the Prophet 08 with some indispensable tweaks! To recap - at its heart is a two DCO per-voice engine with 4- or 2-pole mode Curtis low-pass filter (as found in the Mopho series and Tempest). We were hoping for an analogue high-pass filter this time (like the Tempest) but that’s not included; however, there’s a decent resonant digital high-pass in the effects section and this can be modulated (along with the other FX) which is huge news! Another new (and very welcome) inclusion is the sub oscillator which really helps bass sound creation and can thicken leads and pads too. Most of my reservations regarding the P08 (ie no FX, no sub osc, dif cult to set up modulation routings, to name a few) have been addressed and making sounds is a whole lot more pleasurable - the workflow is greatly improved and the Rev2 is generally more intuitive. Sonically, it’s no surprise the Rev2 sounds much like a P08 at its core but then it seems to sound a little warmer and more soulful overall. You can also go much deeper with the addition of the sub osc, extra voices and the modulation effects; it’s a big upgrade and sonically it’s much more appealing. The reservations we had regarding the P08’s sound are still out there, but rather than be too hung up about these, these are characteristics of this synth that are here to stay, so let’s embrace them! Personally, we found the Rev2 to be much more versatile compared to the 08 and we can see ourselves adding one to our live rig, particularly as it’s one of the only current analogue polys around with 16 voices and dual layers, extensive modulation facilities that are a doddle to set up, plus a very playable 5-octave splittable keyboard and dual 8-voice stack mode which sounds marvellous! Talking of splits, a little split reference onscreen would be handy to avoid embarrassing slips onto the wrong side of the split during performance! Once you add in the arpeggiator, the 64-step poly-sequencer (taken from the Prophet 6/OB-6), the fact that the sequencer also does gated mode (like the 08) plus the fully bypassable effects (also derived from the P6/OB-6), the whole package is very appealing. We really think it’s worth the extra outlay to grab the 16-voice version as this gives you a lot of power when splitting and layering and for making huge chords or unison stacks. As mentioned, the Rev2 has a distinctive edgy character but at the same time it can do beautiful atmospherics now, when using the new effects alongside the per-oscillator shape mod and the gated sequencer for effect modulation. Also, one of our favourite features, ‘pan spread’, is still onboard and this spreads all 16 voices out across the stereo spectrum which makes it sound huge. 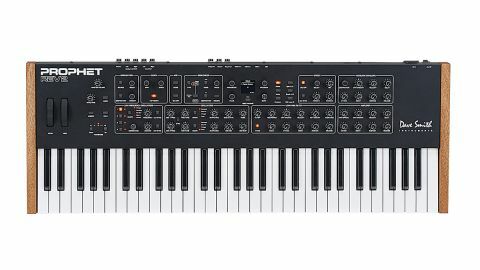 Importantly, we can see DSI shifting a load of these as the Rev2 will appeal to pop, electronic, R&B and soul acts who want solid staple analogue sounds, but also to sound designers too, who want real depth that they can explore. Granted, if you want thick or silky VCO tone like the P6/OB-6, then only the P6/OB-6 will do. However, if you want precise, upfront, modern and evolving DCO-analogue sounds and atmospherics with a whole versatile bag of mod options, splits and layers, then Rev2 is very appealing and inspiring, plus right now it’s the only option (bar Alesis’ discontinued Andromeda) for a 16-voice self-contained multitimbral poly. Basically, it’s everything the P08 was but much better!